Local steps in the save show after violin is damaged during soundcheck. PORT McNEILL—The folk-fusion band Wheat in the Barley spent last week on a whirlwind concert tour of North Vancouver Island’s schools. But what was supposed to be an exclamation-point finale to the tour almost never happened. 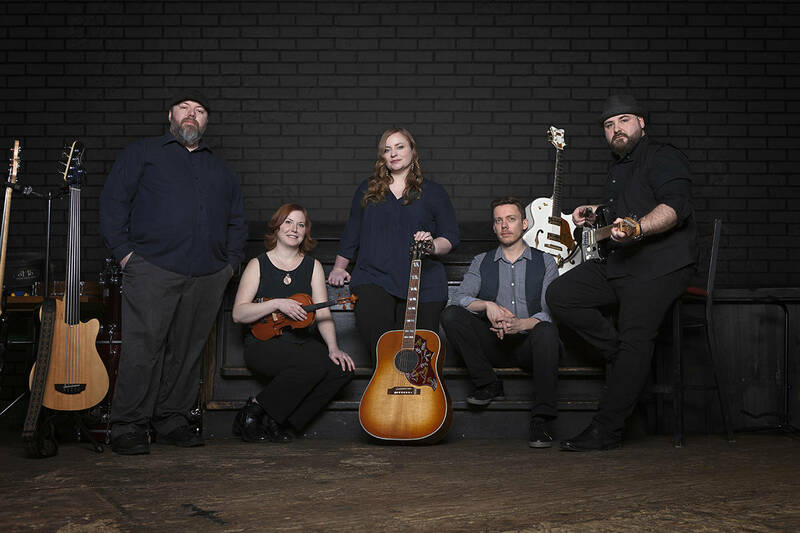 Wheat in the Barley showcased their instrumental virtuosity, stylistic eclecticism and songwriting chops Friday at Gate House Community Theatre before a small but music-savvy crowd. What the audience lacked in numbers — perhaps 40 hardy souls turned out — it made up for in appreciation for the group’s genre-bending skill on stage. The quartet of Steve Gidora, Victor Smith, Nicole Schoffield and Mark Dowding played shows at both elementary and secondary schools on the North Island from Tuesday through Friday last week, and had just performed their sound check for Friday night’s show at Gate House Theatre when disaster struck. Dowding admits to tripping over a cable, which set off a chain-reaction that resulted in Schoffield’s violin being knocked from a small table and knocked to the floor, where its neck was broken away from the body. That led to a series of calls in search of a replacement instrument, which drew in members of the North Island Concert Society and North Island Community Band before a loaner violin was secured from a Hyde Creek teen, who had played the instrument with NICB and the Pacific Winds youth band several years earlier. The loaner violin, delivered about an hour before the start of the show, put Schoffield back in the mix. The 11th-hour substitution created a change for Scoffield, who normally plays with an amplified pickup on her own violin but who had to utilize a fixed microphone Friday. Dowding, whose instrument selection included two saxophones, a flute and a table covered with harmonicas, pipes and whistles, noted Scoffield is also an accomplished pianist. But the group’s numbers were all worked up with Schoffield on the fiddle, and its playlist was too reliant to fulfill with the other three members. Which is not to say the players did not cover plenty of musical ground. With Gidora on both guitar and violin, Dowding’s multiple instruments and Smith’s wide-ranging capability (accordion, percussion, guitar, flute and whistles), Wheat in the Barley has an extensive range covering bluegrass, Celtic, blues, pop and folk, not only North American but Eastern European and South American. Friday’s playlist at Gatehouse was a mix of original compositions from members, traditional numbers, and a hybrid of traditionals modified by the band.”We’re going to do a song Steve wrote, written in the obscure genre of the cossack-cowboy form,” Smith joked while introducing the group’s penultimate number, Can’t Draw the Curtain, from the group’s debut album from the same name. “A Celtic, Slavic blue song,” Gidora amended.